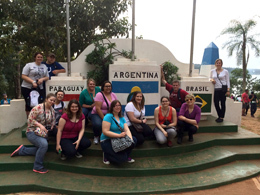 Twelve students visited cities including metropolitan Buenos Aires and went horseback riding on a gaucho farm. The students toured the subtropical rain forest of Iguazú. All students completed a research project while there, May 17-24. Dianne Moneypenny, assistant professor of World Languages and Cultures at IU East, said the students will present their artwork and research from the trip to the community. She said students chose an area of research and then visualized this research with a fine arts piece instead of a traditional paper. The exhibit includes pottery, installation pieces, paintings, sculpture, and more. Moneypenny said study abroad opportunities are important for students. “The student feedback on the trip was fantastic. The trip enhanced their classroom learning; in fact the experiences on the ground far surpassed anything I could have attempted in the classroom,” Moneypenny said. She mentioned that some of the students had never flown, never left the country, and had never been in a taxi before the study abroad course. “Many now feel confident traveling abroad on their own and, by the end of the trip, some even considered seeking employment internationally after graduation. That simply would not have even been on their radar before having this experience. It was so rewarding to witness as an educator,” Moneypenny said. Jennifer Perkins, a student at IU East completing her communications degree online, said she wanted to go on this trip to help her understand another culture. As a high school student, Perkins had traveled to England while studying British literature and found the experience beneficial to be immersed in the culture she learned about. “The trip to Argentina allowed me to use knowledge I have gained from numerous classes while enrolled at IU East. Not only was I able to see and respect the history and the land from the course connected to the trip, but I also practiced my Spanish from the two semesters I have taken, worked on my nonverbal communication skills when the Spanish failed me, and relied heavily on my cultural communication information,” Perkins said. Perkins said as a communications major, she focused on nonverbal communication while in Argentina. “I listened to the rate of speech, looked at how close or far individuals stood from one another in various settings, paid attention to the volume of speech, and noted various gestures,” Perkins said. Teddy Criswell of New Castle, Ind., said he wanted to go on the trip to improve his Spanish. He has taken the foreign language course in high school and college, but wanted to experience speaking and hearing Spanish in everyday life. Also, he said he is a vivid outdoorsman and he wanted to visit the wingshooting capital of the world, Argentina. While in Argentina, Criswell studied the country’s law enforcement. “My project is about the presence of law enforcement in Argentina. I looked at the cops and how they are different and similar to ours here in the USA. The reason I chose this was because I am a criminal justice major and it fit in well with what I am studying,” Criswell said. In Argentina, students toured Buenos Aires including the Plaza de Mayo, home to Casa Rosada, the Metropolitan Cathedral, where Pope Frances practiced as well as his modest apartment building located next door, toured Eva Peron’s grave and took a Tigre River delta cruise. They attended a Tango show to learn the history of the dance and took Tango lessons. In Iguazú the class group went to a rainforest animal rehabilitation center and to the point where Paraguay, Brazil, and Argentina meet. Moneypenny said the travel course was possible because of the support received from the School of Humanities and Social Sciences, the International Studies Committee including Executive Vice Chancellor of Academic Affairs Larry Richards, Vice Chancellor of Administration and Finance Dan Dooley, Interim Dean of the School of Humanities and Social Sciences Ross Alexander, Director of Financial Aid and Scholarships Sarah Soper, Star Johnson in the Office of Administration and Finance, and scholarships from Robert Starr Jordan and Eleanor Turk.